UPDATE! Are Kids Learning to Ride Bikes Later? A confession: I learned to ride a bike when I was 9, probably the oldest of all my friends. Maybe I started a trend? Dear Free-Range Kids: I was recently visiting the Long Island town I moved away from several years ago, and was visiting some old friends. I have a 7-year-old daughter, and she was at a playdate with several kids, ages ranging from seven to ten. I was absolutely shocked to learn that my daughter was the only child out of the whole group that knew how to ride a bicycle. The rest of the kids still had training wheels on their bikes. Can you imagine an eight year old boy riding around a bicycle with training wheels when we were kids? I think that kid would have dropped to the bottom the earth in shame! What is happening? Have you heard any similar stories about kids not riding bikes these days? In my town in Colorado, I see kids riding around on bikes all the time! The kids I was with did have training wheels on their bikes, and were riding around. In fact, at one point, we were on a “bicycle playdate” where the kids rode their bikes around on a tennis court. 1. Kids aren’t riding bikes around the neighborhood anymore, so kids don’t have the same motivation to learn to ride. 3. Parents are concerned for the kids safety riding bikes. The guy who created it deserves a nobel prize. After 2 days of trying to teach my daughter to ride that involved lots screaming, tears, and blood, i found pedal magic and taught her in 20 minutes. Are kids learning to ride bikes (or taking off their training wheels) later? “Never Post Your Child’s Picture with the School Bus License Plate Visible” — Really? 93 Responses to UPDATE! Are Kids Learning to Ride Bikes Later? Here in Sweden I’ve seen the opposite trend since I (now 51) was a kid. Kids nowadays bike often from the age of three, and my impression is that most master biking when they start school. I *think* I was in first grade when I first got a bicycle – a hand-me-down from a cousin four years older. I never used training wheels, though I rode a tricycle at younger ages. That was my first reaction–that it’s similar to kids not getting their license when their 16th birthday hits. Strange, but you can understand if the kids aren’t allowed to be all over the neighborhood (like I was) with only our bikes to get us home after a few hours of playing and riding around. In our neighborhood bikes have been replaced by scooters. They are easier to learn and everyone has them. My son is 7 and we are close to being able to ride a bike, but he isn’t very interested. He has, in his mind, just as much freedom with the scooter as a bicycle. My husband taught my daughter to ride when she was 5. it was literally blood, sweat and tears but so worth it. she was the first kid in her class to ride and it was great that she had this physical achievement (and made getting to school faster). But I guess when kids aren’t allowed anywhere, why should they learn to ride? She is 9 now and don’t have her riding anywhere independently yet, but am definitely aiming to in next year or two. Not in my family – they seem to be riding bikes earlier. I was Kinder/1st grade when I got my bike. My nieces, nephews, and their cousins got those balance bikes at 2 or 3 yo and once they got the hang of that peddle bikes – and often without training wheels or only a few weeks of training wheels. They use the bikes to get around the neighborhood and go on fairly long bike rides along bayous and creeks. In Toronto it’s probably the opposite, kids learning younger. There’s a rage for balance bikes that toddlers can use, and these facilitate learning how to bike on a “real” bike. There’s also an increased push for separated bike lanes, which many adults feel more comfortable having their children use with them than simply biking in traffic. In my anecdotal observations (as valuable as the writers) the strider/balance bike that small kids use these days has kids learning to ride bikes sooner, not later. My pediatrician gave us good advice on learning to ride a bike (because it was a question he’d ask at physicals) — have your kid try on grass. They aren’t as a afraid to fall and are more willing to try solo. We did that and it worked perfectly for our oldest (our youngest learned on a camping trip because all his cousins could ride). I was a single, working mom and we lived in a suburban apartment when my daughter was little. So bike training to a back seat until she was 5. But without much time on the bike she didn’t become proficient until 8. Our oldest (almost 7) was on pedals (no training wheels) at 4 and just completed his first 20 mile ride. #totalparentbrag Our second (3.5) has totally mastered the balance bike, just waiting to be big enough for the hand me down pedal bike. For our family it was a values decision – we want the freedom of free (or cheap) family fun biking together on rail trails so we invested our time and money in good learning bikes and lots of time. And family fun means the first twenty mile bike ride was completed with 2 cousins (8 and 10), Grandma (72), mom (36), and brother (3.5 in the trailer). I didn’t earn to ride a bike until later in life–10 or so. I walked everywhere (or it was too far for a bike anyway), so it was superfluous. I didn’t use training wheels at that point, though; I just took the inevitable scrapes and bruises as a learning tool–if I wanted them to stop, I’d stop falling over! Bikes… and Driver licenses later on…used to mean freedom to be independent. Go where you want, when you want. Now? If they learn to ride a bike, where do they get to go? Around in circles in a cul de sac/ gated community? Followed by mommy and daddy for an out and back down the same street? Boring. I wouldn’t bother either. Kids no longer want freedom and independence. They don’t even know what it is. A sad state for our country in general. Our culture considers bicycles to be toys or sports equipment, not transportation. My oldest is 7, and hasn’t learned to ride a bike yet. He has ridden a bike with training wheels, but he’s very tall, so outgrew those bikes quickly. Due to a raffle at school, he won a 20″ bike, which is actually too big for him (why they decided a 20″ bike is suitable for a first-grader is beyond me). I will likely be buying an 18″ bike for him, so he can learn, and then hand it down to his younger brother in a few months. I was in 2nd grade when I learned to ride a bike, and didn’t use training wheels. But my younger brother and sister got bikes at the same time (Santa delivered them), and both used training wheels. In our case, it’s not “OMG he might fall” as much as “I don’t want to spend a nice chunk of money for something that may or may not get used before he outgrows it.” Furthermore, drivers around my house apparently think speed limits are optional, and so there is trepidation on sending our kids riding, because there are too many people in the area who do not drive safely. We’re in a rural area, and even our private dead-end road has people who think they’re on a drag-strip. Our kids never wanted to learn. We managed to briefly get one going, but she hated it and would never do it again. The other got cornered into doing it…freshman year of high school. The school celebrated bike week by doing two rides with rented bikes. He spent those two class periods teaching *himself* to ride. He got it by the end…and hasn’t been on a bike since. There is a huge downside to all of this, which hits when kids are around 16. We grew up on bikes, often riding on the street. We had street sense, knew the rules of the road, and knew our way around our neighborhood, if not our town, before we got behind the wheel of a car. Today’s kids haven’t been out and about on bikes like we were, and getting them up to speed and ready to drive is a lot harder. The letter-writer’s observation may have been a factor of location as much as anything else. I’ve never been to Long Island, but on googlemaps it looks pretty heavily populated. Bikes are probably not heavily in demand as kid transportation. I went through basic training with a girl from New York City, she’d never even been inside a privately owned car, much less learned to drive one. Different lifestyles require different skills, and given the differences between Long Island and Colorado, I wouldn’t use this one observation as evidence of any kind of trend nationwide. As far as age of learning- I didn’t learn until age 6 because our military life did not allow for me to have a bike in the few years prior to that. Of my own kids, the oldest learned at about 6 when she outgrew her 16″ bike with training wheels and we refused to put them on her new 20″ bike. It took a full Saturday with Dad and tears to master it. Second child at age 5 hopped on the neighbor’s 12″ bike and took off riding. We then removed the trainers from his 16″ and it took him a couple weeks to master the skill on the bigger bike. Third one regularly rode his 16″ along with me on long walks, and just naturally progressed to not using the training wheels at about 5yo, so off they came. Once in a great while I meet an adult who has never learned. They did not have a childhood where a bike was desirable, and never learned. My son is 6 and has training wheels. He’s pretty uncoordinated in general. It does seem like other kids in town have mastered it– he has started to be embarrassed about his training wheels, so he’ll be learning soon. Yes, I have noticed this. I sent my kids to school early, and only one of them at 4yo could confidently ride a bike; I thought the other might feel backward in KG. Nope, it turns out that many many kids in elementary school do not ride bikes. In my childhood, there was one 7yo girl who didn’t ride a bike and also hadn’t started school yet. I knew this because I heard the ladies in her neighborhood tsk-tsking about it. I knew no other neurotypical children who were still in training wheels at age 6 (except a few who had just received their very first bike). I took my kids’ training wheels off when they were 3, because training wheels distort how a bike works. I also understood that if you wait too long to start, kids will develop fears because they think too much about everything that can go wrong. I see kids doing it younger. All of the kids in our neighborhood learned between 3-5. My son took longer and didn’t learn until 7. Not because we didn’t let him out but simply because he didn’t see the need. Like Simon says (heh) training wheels are counter-productive. My son learned to ride a bike at age 6. Took some minutes over two weekends (well, 2 Sat, 1 Sun) and he was riding by himself. The kids in the neighborhood all were riding bikes about that same time. Well, I think the problem is that kids aren’t outside playing anymore. There are atleast 10 kids in my neighborhood ages 6-14 I never see them except walking to/from the bus stop that’s it. I think kids really do want the freedom and independence we had, but they simply aren’t allowed to have it. I’m sure this varies widely; it may have varied widely in the70’s when I was a kid. It’d be interesting to see a properly done survey, and also one that broke it down into rural, suburban, and urban. My son was almost 7 when he got it down and my 5 year old daughter was so inspired that weekend that she got us to take her training wheels off, and had it down two days later. We live on a very busy big city street so all the practice when they were younger was in the driveway. Now it’s nice, because they can actually go places, although I still worry because our street is dangerous for any cyclist! Sometimes I fantasize about moving to the suburbs, with safer, quieter streets to ride on, but I’ve been told that while people there ride bikes around, not many kids ride TO anyplace. Everything is too far away! I hope that’s not widely true but when I look for homes for sale, I pay more attention now to whether the neighborhoods have parks, schools, and stores within actual walking or biking distance and I’m surprised by how many neighborhoods are just miles and miles of houses. I wonder, too, about swimming ages. I imagine people are swimming earlier and more of them are learning, but I really don’t know. I just know that my father in law never learned to swim and that just astounds me since he grew up in a warm climate. I see a strange divide. Today a lot of kids are using balance bikes. The kids that use balance bikes typically learn to ride at a much younger age, those that don’t use balance bikes learn much later or not at all. My two boys learned to ride at age 3.5 and 4.5 after mastering the balance bike. I think it is just that kids don’t ride bikes as much anymore, so if they are part of a family who doesn’t ride, then they have no reason to learn that particular skill. I actually think kids ride younger now, simply because people have more money to spend on stuff like a series of tiny bikes in graduated sizes. In my (very large) family of origin, there was one small bike for whoever was just learning – about the right size for a 7-year-old, one smallish bike for the second youngest, and everybody else rode whichever of the full-size bikes they could get their hands on first. “Concerning training wheels… they are detrimental to actually learning the balance.” This is so true. Riding a bike with training wheels is basically like riding a very tall and wobbly tricycle. It teaches the child patterns of action and reaction that would be disastrous on a real bike, especially in mounting/dismounting, handling turns, and braking. I’m mystified why anybody gives their kids training wheels, and the only explanation I can think of is that since most American adults hardly ever ride bicycles, they have no idea how counter-productive training wheels are. Without training wheels, learning to ride a bike takes one or two days; with them, it can drag on for years. My family has moved around quite a bit. Each home has come with its own set of complications that delayed learning to ride bikes. Our home in VA was a compact and very busy apartment complex with few safe areas for kids to be. The rental in NY was in a “snowbird” community and we were often told the kids were being too noisy, damaging landscaping by being on the grass, etc. after the first summer I gave up trying to be a part of the community so we went to playgrounds instead. We also had 4 kids under 5 at that time so helping any of them on bikes was challenging. When we got to TX we just didn’t have the time! My husband worked 70-80hrs every week for two and a half years while I juggled getting our oldest her ADHD diagnosis and keeping her on track at school (homework has been a 3hr + struggle from the start of K.) Now we’ve moved to WA, our lives have calmed down. I feel guilty we didn’t stress learning this skill earlier but they don’t seem to care. Training wheels, scooters, and roller blades give them the freedom they want and that is all that matters to me. I kind of forced the issue, especially with my youngest who is not athletic. I would put the kids’ bikes in my trunk (we live on top of a hill so not a great place to learn), and we’d go to the park and I’d make them practice for a while each time. Lucky for me, my kids were little and could use the 13″ bikes until they were about 5, then 16″ for a few years after that. So I was able to put their 2 bikes in my trunk and have them ready when were were at a good place for riding. Although my kids could ride at 4 and 5yo, it wasn’t really something they wanted to do much. Except where other kids were riding bikes, which nobody did around home. Oh and by the time I was my kids’ age, I knew how to fix a flat and would carry a repair kid etc when I went on a long-distance bike ride. My kids would have no idea. I’ve been happy to not need to deal with punctured tires, but on the other hand, it would be good for them to learn it. My son learned to ride a bike around seven as did most of his friends. They all had those fancy scooters when they were younger. I think that is why they rode bikes later than we did. We didn’t have those neat little scooters when I was growing up. And I’ve found that bikes are pretty cheap now compared to when I was a kid. I have only bought WalMart junk because we are not “serious bike riders,” and we’ve had no problems. It is certainly affordable to pay $25 or $50 or so for a kid’s bike that will be used for a few years. 2 things I would ban… training wheels and water wings. Neither help “teach” the skill, in fact they actually make it more difficult to ride or swim. Both probably evolved as ways not to have to be WITH your kid. Here go ride this bike without me. Here go get in the water and I won’t have to be right with you, i can watch from my lounge chair. And water wings are actually dangerous. Kid raises his arms overheard in the water and they can slide right off… trying to actually execute a proper swim stroke with water wings is nearly impossible. Anyway… kids leaning to the side on their training wheels… take much longer to learn than just throwing them on a real bike for a day or two. I do agree that a lot of parents just don’t want to ask their kids to do things if the kids don’t feel “ready.” Whatever floats your boat. I saw that the most with potty training. What a big change in customs – which is fine – but also in beliefs about what a child can do. Nowadays the “experts” try to make parents fear starting potty training at the age which has been considered developmentally normal, globally, for millennia. The amazing thing is how many parents fall for it. Thing is, there are times in a child’s life when it’s pretty easy to say “we’re going to do this now.” And no, that does not hurt the child. Instead of doing this at age 1-5, we are doing this at age 13-17, saying “no you are *not* going to do this now.” We have it bass-ackwards. I’m not sure on this one. I don’t see a lot of kids riding around outside, but I don’t see a lot of kids period. It’s usually either hot or rainy, so it may just be a kid preference thing and not so much a parental control thing. When I lived in a larger city, it was more bike friendly and I would see lots of adults riding around but not many kids. Again could have been preference thing (lots of other cool stuff to do with more technology, hot and rainy, etc.) adults rode bikes sometimes out of transportation necessity. There were kids walking solo, though. Personally I grew up free range and I didn’t learn to ride a bike until I was 10ish then never really enjoyed it much. My kids don’t have bikes and have not requested them or seemed interested, and I’m just as free range as can be. All anecdotal experiences, but just saying it may not be entirely about “safety” and just a matter of different interests. I was around 5-6 when I learned how to ride without training wheels–around the same time that I learned how to skate. We lived in a small Arkansas town in the mid ’70s-early ’80s and most of our activities revolved around bikes or skates. No helmets then, either–not that I think helmets are a bad idea. When I was around 8-9, I finally decided I was ready to learn, for real. Took a few tries, and some falling down, but I managed to do it on my own. Never had training wheels. I wasn’t “pushed” per say, but I was definitely encouraged. Ok, I got a nudge every so often. But I was glad I got those nudges. If I didn’t, I probably wouldn’t have learned till much later, if at all. Sometimes kids don’t know what they want, until they are actually doing it. So just because they say know to trying something new, doesn’t mean we give up on them from learning. Kids should learn many things growing up, it’s the only way for them to know what they like and don’t like. And it allows parents to see what their children are capable of. Don’t set them up to fail, by not encouraging and supporting them. My elder had not interest in learning. I was delighted when her middle school P.E. made bike riding mandatory. And she was *not* the only 7th grader who didn’t know how. My 3 years younger daughter had already been riding for some time by then. There were a few kids her age in our neighborhood who had been riding around, so she wanted to join them. Balance bikes!! Training wheels are sooooo passe now. My kiddos rode on balance bikes as preschoolers and could ride full two-wheel bikes by ages 5 and 6. Now if we could just get past that expectation of cladding the little darlings in all of that protective gear — knee pads, wrist pads, and Medieval iron armor. My son got his training wheels off at age 4 (he’s 7 now). Most of the kids in our neighborhood learn by about 5 or 6, and balance bikes are more the norm than training wheels. Training wheels were also not a thing in my family, except for the minority of kids who got “new” bikes. And then they were taken off very soon after purchase. I was 4yo and I was taught on my brother’s hand-me-down bike, by my neighbors and siblings. I’m pretty sure I learned in 1 or 2 sessions, because the desire to ride with the other kids was great. Yes, I was scared and I remember doing some things to try to protect myself, which were not helpful, but eventually I realized I did not need to fear. Not at all my experience. Indeed, our preschool had a batch of Strider bikes that the kids loved and learned their balance on. I’ve been shocked by how many 3- and 4-year-olds who ride comfortably — which was NOT the case for me at that age. Our very large school district cut bus servive to those within 1.5 miles of school and also invested in improving the infrastructure to have dedicated bike paths connecting neighborhoods to schools. Our town also completed a rails to trails bike path and a new highway built included separate bike lanes. There are TONS of bikers and kids learn young around here. There’s some positive peer pressure to learn to bike, do they can join other kids going to school. It is tge fastest way to get there! I remember when we first started biking- I had a 1st gradee and 3rd grader and biked with them for the first few weeks of school until they *got* it. One of our neighbors couldn’t/wouldn’t ride a bike. He finally got it the day before the first day of school and his parents sent him on bike the first day. I watched him bike into a tree that morning! Pulled leaves out of his hair, gave him a band-aid, and told him he was brave for riding to school. I really love biking, but there are places that just aren’t fun/safe to bike because of the infrastructure. Which is sad, because so much good freedom and childhood adventures can be had on bikes! “Bikes… and Driver licenses later on…used to mean freedom to be independent. Go where you want, when you want. Now? If they learn to ride a bike, where do they get to go? Around in circles in a cul de sac/ gated community? Followed by mommy and daddy for an out and back down the same street? Boring. I wouldn’t bother either. Kids no longer want freedom and independence. They don’t even know what it is. A sad state for our country in general. Biking has definitely become an “activity” in itself – complete with safety equipment – instead of a way to get around. The usual age is still around four where I live, because we’ve got a really good street for it, but becoming confident on a bike takes a lot of practice, and the more of a “production number” something becomes, the less it usually happens. I honestly blame a lot on helmet laws, too. I do see the reason for helmets, of course! – But even good things have a cost, and there were many times that my son didn’t bother getting his bike out because it wasn’t worth it to him to wear an uncomfortable helmet that would either make him too sweaty in the heat, or not cover his ears in the cold. I also agree about the freedom aspect. My husband I were just talking the other day about that same son (now 16) and his friends not being in a hurry to get their drivers’ licenses. We came to the conclusion that a big part of it was the rule here that you can’t drive any other kids but your own siblings for the first six months. It just doesn’t represent that instant moment of freedom, for yourself AND your friends, that it used to. I have definitely seen this phenomenon. I think my son was 5 when he learned, but plenty of friends didn’t know how to ride until 9 or 10. That said, I didn’t learn as a kid. Biking was not important to my family and I had a big crash when I was learning and stayed away. BUT it was like my badge of dishonor so when I was in my 30s, I finally crossed it off the list by learning. I love it now. I have one kid (the older) that if I push her, she will try to get me to leave her alone. If it doesn’t work out, no big deal. I have a second kid that if I push her it pretty much leads to disaster due to her temperament. Better is to push the older one into doing whatever which by default makes the younger want to try sooner. If it is her idea and it doesn’t work out, she picks up and tries again later. In my neighborhood they usually learn earlier like 4 or 5 on balance bikes. If they don’t, many never learn or try it late like ten or twelve. What that tells me is the parents push it, or the kids don’t find motivation until they have a need. I think the opposite, kids are learning earlier. I had training wheels until I was 6, when I asked my dad to help me take them off so I could try without. Now, parents are spending money on programs to teach their kids how to ride bikes by preschool, what?!? why spend all this money on balance bikes and training programs?? It almost seems like a parent status symbol that their kid rides a bike at four (at least in my parent group). I didn’t feel any shame about having training wheels until I was 6, maybe because my dad never acted like it was shameful. I feel like this falls under the banner of “when the child is ready”….just like tying shoes and staying home alone. Lots of variables come into play. The child’s personality, whether the parent makes it a priority, where they live, easy access to practice, access to a bike ….list can go on and on. My oldest learned 8 weeks before turning nine. He’d had access to all kinds of riding toys at child care and at home including a balance bike. He just wasn’t into it and we didn’t push it. It wasn’t a battle that we felt was critical….we had too many other things to focus on! He now loves it and we rode to the library to get books last week. I let him ride around the neighborhood on his own. I don’t feel the loss of extra years of practice has impacted his ability to successfully ride a bike at all. It was the right time for him and he loves the independence which we support. His 4 year old brother on the other hand is a speed racer and took to it immediately….same child care and access to riding toys. He asks to ride his bike and I think he’s already ready for the training wheels to come off. Very different kid and slightly older parents just trying to support their unique interests. I don’t worry about age milestones. We push on some things, not others. It depends on our families priorities. But we always get there…eventually. I started biking with no training wheels at 3, and so far, the oldest one of my bunch has been 5, for which he received relentless teasing from his older brother who learned at 4. They can all swim, too, from about the same age. I consider myself an early adoptee of helicopter parenting (90s kid who really didnt have that awesome “ZOMG 99s KIDZ LIFE RULES!! !” experience, so I didn’t learn til I was 10 (almost 11). Now I think it’s a mix of what other posters said; Balance Bikes are getting kids to learn earlier, but with our overprotective culture, there’s really nowhere they’re allowed to go on them, so bikes fall out of “style” and kids get schlepped around til they decide to get their license. And then it’s harder because like Ann in LA said, they don’t know their way around. I don’t know if it’s a product of location, but I’ve lived in Southern California for the past 5 years now, and 89% of the people I know who have lived here their whole lives don’t know how to get anywhere! My kids didn’t see the need, but I could look ahead to times when they would want to ride with other kids. I knew they couldn’t just decide it was time to ride when that happened. So I decided they were to learn. To me it is the same as any other life skill. I didn’t wait until they asked to learn to read or swim or use utensils. I guess some other parents don’t think their kids will ever be in a situation where it matters that they are left out of bike riding. Maybe they are right, but I don’t regret teaching my kids. My son’s 7 and he just doesn’t care to learn it. My sense is this trend has to do more with competing leisure-mobility products like hover boards and the miniature motorized battery vehicles kids are playing outdoors with these days then anything else. If bikes smaller than the typical banana seat bike even existed when I was a kid, I certainly never saw them. I had a tricycle until I was about 5, then got a banana seat bike which I learned to ride when I was six. I lived in Rantoul, Illinois, where we had a driveway and reasonably untraveled streets we could ride in, plus an undeveloped area that allowed for great dirt biking..
My kids got their first bikes at two or three – those tiny bikes. The older one learned without training wheels at age 5 because her father was bound and determined she would. The younger one also got taken out to learn when she was 5 but she’s a lot more willful and just wasn’t having it. She’s 8 now and just got motivated to learn this summer because she has a friend who goes riding a bit. But we live in an urban environment (Chicago) with no driveways, a fair number of pedestrians on the sidewalks and pretty busy streets, so I just think biking isn’t as much fun for my kids as it was for me. The younger one and her friend rid over to their school “playground” which is just an open blacktop – that’s about the most open area for them to bike around. The next town over is very bike friendly and I see a lot of parents actively teaching younger kids to ride, riding with them to school, and older kids out riding on their own. If training wheels are detrimental, then so are tricycles. It is literally the same thing and for some reason, no one complains about tricycles being bad while training wheels gets a chorus of complains each time. So we used them, with the above logic. They helped teach how to pedal, the kid could focus on leg motion without needing to care about balance – which meant the kid could look at legs while pedaling at first. We removed them once the kid could pedal for long without need to focus on it. I don’t think they were detrimental. One kid learned to put everything together within one session after they went off (maybe around 15 minutes till we claimed learning biking is done). The other needed two sessions – first around max 10 minutes (attempt failed) and then less then 20. Both had balance bikes before, both were 4. I don’t think kids learned that soon in the past and not everyone knew how to bike in the past. I know adults that can not bike or barely learned it quite late. Some street had culture that required every kid to learn biking and every parent to teach it, but other sub-cultures did not cared about teaching kids to bike. A tricycle is not the same thing as training wheels. Training wheels are smaller than the main wheel, and more importantly, offset. They teach the child to lean to one side to stay upright which doesn’t go well with the laws of gravity once they are removed. Tricycles are balanced and centered and good for learning to pedal and steer. I’ve seen kids around here who look young enough to be riding tricycles riding on two wheelers without training wheels. Maybe it all depends on where you live. I live in a semi enclosed condo complex so maybe parents feel safer later there kids ride on the sidewalk. I taught myself at age seven (after days upon days of my dad failing to teach me), and then taught myself how to swim at age ten.l (again after a long time spent failing to learn in other ways). My cousin didnt learn until almost eight, but it took her just a few hours. Its mainly a confidence thing, as well as coordination. Actually, now that I think about it, I don’t see many kids on trikes either – except for those ones with a handle at the back for the parents to push. Maybe all the trikes are kept in the back yard? Before I was a bike rider (age 4), I used to ride my big trike up and down the block. Kids used to ride them to the playgrounds. 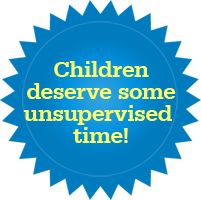 I run a home daycare and I have 2 school-aged kids that I care for before & after school…. they’re 8 and 10. The 10-year-old boy was telling me a story recently about the time his grandparents took them for a ride on the bike paths at a local park. He looked confused, and replied, “No, I was 10. It was like, when there was still school” (I guess he meant before school ended for the summer). I was stunned. I really shouldn’t have been, I know their parents are first-degree helicopter parents, and the kids are very socially and emotionally stunted as a result of being treated as if they were half of their respective ages…but I hadn’t yet heard of this delayed bike riding phenomenon, I guess. I had to quickly backpedal (no pun intended, lol) and reassure them that it’s not a big deal, they can learn anytime, it’s easy, etc, and I offered to help in whatever way I could. The poor sister isn’t as clueless as her brother and she said she doesn’t even want to go bike riding because she’s so embarrassed and she thinks people are looking at her weird. When I offered to take them somewhere where they could learn and practice where no one would see them, they both brushed it off– because A. They weren’t sure if Mommy would give us permission, and B. They’d just rather not, they claim to “not like biking” anyway. Gee, I wonder why! Absolutely, great point. When we lived in New York City, all the kids, including my own, had little scooters. They could go FAST on them. My son now much prefers his razor Scooter to his bike. His bike is a lot slower (obviously, a bike CAN go much faster than a scooter but it takes more practice to get to that point). I’m in Brisbane Australia. We have some amazing bike tracks over here! Some of these are not bike lanes that share the road with cars, but they are bike and pedestrian only roads! I love to ride! Sadly I rarely see children on bikes. When I do, it’s always with their parents. @Donald- We love dedicated bike paths too but this summer I’ve seen a ton of young kids biking together and some streets blocking off areas with those turtle guys and yellow tape to have the little kids bike in the streets and neighborhood bbqs. I have a tween and two teenagers (one with a permit- he cannot wait to get his license!) and they bike to their friends and summer jobs while parents work. All of their friends do to. My youngest asked to bike to Rite Aid with her friend the other day @2 miles away- no major roads- because they heard they had Halloween candy and they wanted to check it out. She asked for money, I said no, and then asked if she could look in the spare change jar. So they went. My apologies to the cashier who had to count pocket fulls of coins for candy corn purchases and other disgusting stuff. They had the best time. It appears that there is little more than anecdotal accounts of this. It would be nice to see a survey conducted in different places and with different generations, so we can see what is really happening. I don’t think learning to ride a bike is necessary for children, so I don’t think we should view its decline as a bad sign necessarily. A sad sign for those of us who grew up riding bikes, maybe, but each generation is different. I never learned to ride a bike. I also didn’t get my driver’s license till I was 28 and had 3 kids already. But I did grow up in NYC, so it was very different from how most Americans grow up. I didn’t need bikes or cash for freedom and independence because I had the subway. Though I definitely don’t recommend waiting until adulthood to drive- the older you get, the more difficult it is to acquire the skill, and I also never got comfortable with driving. I do it when I must and try to avoid it as much as possible. My oldest is 6 and still uses training wheels. I hope to take them off soon, but my husband works very long hours and doesn’t have a lot of time to teach him to ride and I, well, I can’t teach what I don’t know. Ooh, and guess how I learned? My parents, getting sick of the boring flat sidewalk that didn’t seem to be effective, took me to the park and pushed me and the bike down the hill. I had to balance on that two-wheeled death trap to survive, my mean parents. Funnily enough, I still live near this park and that hill must have been flattened at some point because it’s not nearly as steep as I swore it was. My kids ride, but don’t get to ride often. We live in a small neighborhood but the roads are curvy and people drive like idiots. I hope to ride more with them in the fall. The trend of the last 50 years has been to avoid any discomfort. In fact, this trend has developed into an obsession in ridiculous proportions! This has had an opposite effect. By trying to avoid pain and discomfort, we made pain and discomfort grow like a plague. What’s this got to do about biking you may ask? When I was young (about 100 years ago) we got used to many things on our bikes. Peddling was tiring, the weather was either hotter or colder than we wished, and I sometimes found myself miles from home with a flat and had to push my bike for a long time to get home. I was 12 (mom was afraid I’d get hurt!) My son learned at 6 1/2 . He got called out by the neighborhood girls for still having training wheels. So I got a broom and stuck it in the back of his seat. 2 hours later he was good to go. I never got to do risky things and it made me afraid to try new things. Hoping my son never has to feel that way. Balance bikes seem to be driving it earlier. I was considered young at 4, but a,few,of my son’s friends were that age. Mine started on one with no pedals or training wheels at 2, and only needed a few weeks with training wheels at 4. My sister learned at 3, but only because I tried to kill her. Loosened her training wheels so they’d fall off and she just kept riding when they did. Cycling for transport is a part of daily life here – not just for children, but for people of all ages. It’s designed for and counted on in terms of distances to amenities and parking once there; separate bike tracks along main roads and 18mph speed limits in neighborhoods, with motorized through traffic kept out as much as possible and bike-only shortcuts to shorten bike trip distances. In other words: your parents are cycling too. Opting out of cycling because you don’t feel like learning it is therefore out of the question, because do you really expect your mom to carry you on the back of her bike forever, on top of two pannier bags full of groceries? Forget it! Besides, your little brother will soon be too heavy for the seat on mom’s steer, so no room for big kids anymore. Being too young to go places by yourself is also out of the window as an excuse, because in those years you simply cycle next to mom, getting some traffic lessons along the way and learning to stick out your arm to indicate directions and to look over your shoulder while keeping a straight line. Of course those years of practice make it safer once you are old enough to go solo. Now with balance bikes I guess ages could have gone down… though I’m guessing there is a practical issue here: younger kids aren’t suddenly taller once they can cycle, and it’s not practical to cycle next to a child that is so short that you have to lean over a lot to be able to hold their shoulder to guide/catch/push them. So what I recall seeing are either small children riding one way or another on the sidewalk with parents walking (and I honestly don’t remember if there were any normal bikes among the used devices), or parents cycling next to a child that did look 4 or 5 to me. We live in a very urban area (San Francisco), we have narrow streets, hardly any proper parking, and people drive like assholes. In other words, we are not in a bike-friendly area. With that said, Little Man is almost 7 years old, he has a bike, it has training wheels, he has his helmet, but he doesn’t want to go out on it much because we don’t really have a safe place nearby where he can learn. We can haul his bike to the bike path a mile away but by then, he’s changed his mind (he’s 7, they do that…a lot). I learned when I was maybe 5. I had been trying and trying and trying and sucking and the one night, I had a dream where I learned to ride and the next morning, lo I knew what I was doing. No idea how that worked but it did. And I even remembered after I had gained well over 100 lbs and hadn’t ridden one in over 20 years. My kids took off the training wheels at 5 and 7. The younger one could have gone without them earlier, due to having loads more time to ride a balance bike after the older started school. We made an intentional effort to get them riding by summer. We don’t have many kids in our neighborhood, so we knew no one else would show ours how it’s done. 😉 I suspect other parents are putting their efforts into other activities (like soccer). Personal experience that once the training wheels were off, they didn’t want to learn and I never understood why. My eldest son did learn about 7yrs old and just received a new bike this year (he is now 12). Soon after he received his new bike, the neighborhood kids tried to get as many kids together to ride around the neighborhood, so he joined. My other two boys (ages 10 and 8) had NO interest in riding bike but, that night, sat in the front yard, witnessing the independence and freedom of all these kids. That was less than 2 weeks ago, tonight all 3 biked the neighborhood with the other kids. They had no idea how biking can open up their world. I think there is something to be said for letting kids do it when they want to do it. I took my kid’s training wheels off at 5.5. She was definitely not ready. It was major drama. I put the training wheels back on. I could have pushed, but why make her miserable? A year later, her best friend could ride without training wheels so she had to do it too. She came home from a playdate, insisted I take off her training wheels and taught herself how to ride by riding around our pool (only good place to ride close to our house in Samoa). I think most parents use training wheels incorrrectly. I always see them flat to the ground in the same plane as the main wheel. They’re supposed to be *elevated* (maybe about half an inch to an inch) so that they only contact the ground in case of a major lean to one side. I think my twins learned to ride without training wheels at about 3 1/2 years. Beforehand I spent countless hours researching various pedagogic methods and technologies to help kids learn to ride without training wheels. I was prepared to use several of them, but what actually happened was that as soon as I took off the training wheels, the kids said ” Bye daddy!”,got on their bikes and took off at speed and with perfect balance. So weird!!! My 4-year-old nephew (5 in about 2 weeks) learned to ride without training wheels within the last month. When my 5-1/2 year old son heard that his younger cousin had learned (we saw Facebook video only, since live aobut five states apart), he immediately asked my husband to take off his training wheels. After just a few tries, he got the combination. My daughter learnt to ride a proper (without training wheels) when she was 6yo – and she was by far the oldest of all the kids I know to learn to ride. Her 4yo sister learnt to ride exactly 2 months later… and that still seemed old. Everyone these days uses balance bikes instead of training wheels which seem to be why everyone I know learnt to ride much earlier (my two daughter had training wheels, my third child will be getting a balance bike!!). Incentive might be missing. I was diagnosed with a coordination disorder as a kid– special grips to hold pencils right, difficulty with buttons, and a tendency to fall down for no reason were commonplace. But school rules said you could ride your bike there starting at grade 3, so there was no reason to have the training wheels off before then, even with the neighboring 5-year-old going without. But the summer before grade 3, I got more bloody knees and scraped elbows– and more afternoons with my mom holding onto the back of my bike– than I like remembering. But with so many places against kids walking home alone or doing anything alone, what’s the point in them learning to ride? I learned to ride a bike without training wheels when I was five, almost six, which I think was on the later end of normal at the time. It was the spring of my kindergarten year, so this would have been early 1990. My brother learned (I think) the summer before he started kindergarten. Anyway, as for the training wheels versus balance bike debate, I agree–I got that bike, with training wheels, when I was three (or maybe almost four), so I rode it with training wheels for a few years, and it wasn’t all that different from riding a tricycle. If I’d had the chance to practice balancing from the start with a balance bike, I wouldn’t have been afraid of falling. I’ve heard that you don’t even actually need to purchase a balance bike for a child who’s learning to ride; just start with a regular bike, but remove the pedals, and adjust the seat so that both of the child’s feet touch the ground, and then put the pedals back on once the child has mastered balancing, and is ready to start working on pedalling. I think that makes much more sense than using training wheels, because the striding motion used to ride a balance bike, is similar to the striding (or “kicking off”) motion necessary to get started on a regular bike, so the skills build on each other. With a bike with training wheels, the training wheels hold the bike upright, so there’s no need to get momentum going in order to create centrifugal force in order to stay balanced. My daughter started learning at age 4 with a balance bike when we lived in Germany. Balance first, then peddling. No training wheels needed. I took the training wheels off my son’s bike when he was 5. Before I could stand up to “balance” him, he was off and pedaling. My daughter was the same way. My kids are 4 and 8 and neither are really riding bikes yet, though they can scooter decently well. My son can somewhat ride with training wheels though. The honest truth is that we just have not prioritized learning it as life has been busy and all the bikes in our garage are hand-me-downs that need a bit of fixing up. They will probably both learn by next summer though. Myself, I got a bike with training wheels that I loved at age 7 but outgrew it during several moves in quick succession before I had learned without the training wheels. So I was 10 before I got a new-to-me bike that fit me (with a banana seat…lol) but no training wheels and I quickly learned in a couple days time and rode that thing ALL THE TIME for the next 3 years. My children leared to ride bike at six:- we don’t have sidewalks or it would have been sooner. My stepson is sixteen and can’t ride worth jack- his father wanted him to learn and Mom wouldn’t make him because he didn’t want to learn. That experience made me add riding a bike proficiently to the basic life skill list. Regarding teenagers and driving- he will do driver’s Ed and get his permit. Adding my stepson to the insurance will be $2000US per year- that is a lot of money and we are a middle class family. We do not have a spare vehicle and until he has an after school/summer job he will have a permit. For our family, the lack of license isn’t about teenage disinterest but money. My husband learned (without training wheels) at age 8 – his family refused to buy bikes for kids who would grow out of them quickly. My husband is now an avid cyclist. I learned with training wheels at age 5. My oldest refused to learn on a balance bike until he was 4 – then he got on and rode. Same thing with a pedal bike – when he turned five he spent 15 minutes with my husband in a parking lot with a pedal bike and was off. My younger one would have learned at 2 if I’d bought him a tiny bike – he wanted to be like his brother so badly. After teaching two kids to ride, in my very limited experience, teaching them to look around, how to brake, slow down, the rules of the road, to keep to the right, etc., all of these things are actually more difficult and time consuming than teaching balance and pedaling – that’s just the beginning. We recently moved to an urban area after living in a sleepy little town where there were always people out on bikes and walking; it’s like relearning how to navigate a bike all over again. I’m also a little concerned about having our bikes stolen so we don’t bicycle as a means of transportation as much as we used to. I suppose that’s one I have to get over. For teaching the kids the rules etc. in a safe place: I used to take them to a park that had a “Safety Town” as a permanent feature. No cars etc. My kids weren’t so good at listening though. When they know there are no real dangers, they just play. @papilio, my husband is an avid recreational cyclist. As an overweight mother of three, I must admit I don’t get on my bike often, but last year my daughter, who walks to and from school, wanted to ride one morning, so I rode with her (first time in several years) to help her navigate the considerable city traffic. I am sure I looked very foolish but I’m sure that I’ll do it some more this coming year, in spite of it. I’m pretty sure, barring some sort of balance issues, that one cannot unlearn riding a bike. Bingo! You hit the nail right on the head there Stacey! Once in a great while when I see a youngster of about 10-years of age out riding his bike in my subdivision, I think to myself, GREAT! Finally, there still are kids who are independent enough to buzz around the neighborhood on their bikes just like we used to do and I get encouraged by it. But then upon closer examination, sure enough, there had to be a catch behind the scene I just saw, because mother hen all of a sudden appears on the scene riding her bike about 30 yards behind junior while keeping a close watch on him. Kids nowadays can’t even ride their bikes without adult supervision! . I am not surprised by this, and think that it’s because kids no longer go anywhere alone, hence they don’t need self-transportation. As you might guess by my being active on this blog, that is not the case at my house! My daughter learned to ride sans training wheels at age 4, and my son at age 6 on the same day (she figured it out and he finally accepted that he needed to stop fighting us on the matter!). They now ride long distances (1-2 miles) to friends’ houses, at ages 8 and 10, through the neighborhood. For short distances though, they do prefer their scooters, as other posters have mentioned. It’s less trouble to hop on and get going, and I don’t make them wear helmets on the scooters, unlike the bikes (to me, a scooter is no different than walking, as you can very easily step off in a crisis; a bike, on the other hand, has you entangled in it and higher off the ground). Like driver’s licenses, riding a bike is a rite of passage, a milestone, a sign and act of independence that most kids today seem unmotivated to achieve. Sad. papilio – The last time I rode was to the local taco stand to get tacos this spring. I need to ride more. I have not had a bike for most of my adult life so there were times that there was a decade or more between rides. I still know how to ride so I don’t think it is possible to unlearn once you know how absent some medical issue that impacts your balance. We live in London, UK and the bike culture is massively on the rise. A balance bike teaching method is becoming more and more popular. 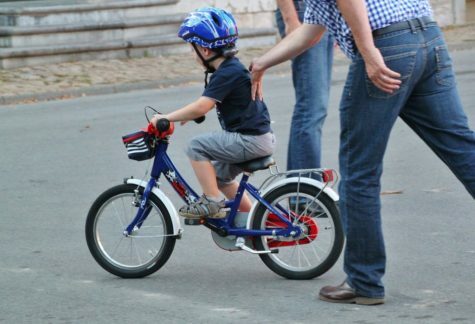 A little top for a transition from a balance bike to a pedal bike: take both pedals of the pedal bike and let your kid ride it as a balance for a few weeks. Once they are comfortable with their new “balance” bike, put one pedal on, let them push it for 10 – 15 min to get the concept of pedaling and then put the second pedal on as well. It took my husband 20 min to get our 3 to going. We are very fond of this method and taught many kids of all ages from 3 to 11 to ride their bikes by first taking the pedals of their bikes and teaching them to balance and once they are comfortable – to ride. I’ve wanted to teach my kids since they were 4 or 5 BUT after divorce many things I desired for my kids were delayed. I will say that i tried to compensate in other ways. They had scooters and skates, swimming lessons and gymnastics. They’re 8 and 9 years old now. Finally this summer, after camp I purposed to teach them. It only took a few hours thank goodness! I’m fulfilled in being able to share one of my favorite childhood pastimes with them finally. I still remember learning cycling during my early school days. Each time I got bruised, I would not touch my cycle for days.Visit http://littleville.co.in/ for interesting learning activities for kids. I know I’m late to the party. I bought my sons balance bikes when they became confident walkers as we live on a cul-de-sac with lots of kid bike action. Both started around 18 months old. We eventually added tricycles to the mix, when the older one was ashamed at swimming lessons when he didn’t understand the foot motion of pedaling. The big kids on the street actually use the trikes a lot. I think playing with the littles “at home” is a nice unwind from being cool at school. This summer the 4.5 and 3 year old moved to bikes without training wheels. They now ride the trails behind our house with dad when he takes the dog for a walk. Our friends who are now next-door neighbors have a 5 year old on a giant pedal bike with training wheels and wooden blocks to make the pedals higher. Labor Day weekend he took off the training wheels, though everyone involved prefers when he borrows the 14″ and 16″ bikes rather than his 400″ (or so it seems) bike. His parents are now on the hunt for a smaller bike at a garage sale, as many of these bikes are sold for cheap heading into winter. I was 5 when I learned to ride without training wheels. My mom sent me and the neighborhood kids town a long grassy hill at the park and we all shed our training wheels the same day. I was always terrified of the training wheels, and that fear of that wobbly almost falling feeling is what led me to Striders for my boys. They ride around the neighborhood, and once a week they go to a homeschool session at an indoor bike/skate park. So much fun! Unfortunately we live too far out of town to ride to the store or fast food like I did as a kid.